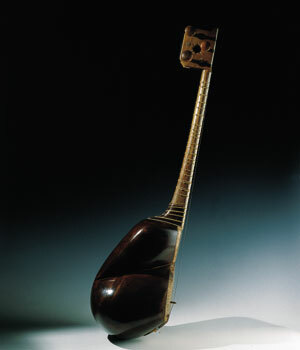 A six-stringed, plucked instrument with a skin-covered soundbox. These six strings are tuned in pairs, the high-pitched and central pairs in unison and the bottom pair in octave. Originally there were only five strings. The sixth was added by Darvish Khan and is called the Mostaq string. Adjustable string frets are tied around the long-neck, giving a scale that includes the twelve western notes plus several semi- or quarter tones. Of course, all the notes are never used in a mode, but seven or eight pitches are chosen from among seventeen possibilities. A small brass plectrum, or mezrab, inserted in a lump of wax is held in the right hand. The fourth finger of the left hand is also used to pluck the strings for ornaments. Notes may be raised or ornamented by sliding the strings over the frets with a sort of squeezing motion of the left hand. The tar has a sister form in the Afghan rebab, also an ancient Persian instrument, and in the Indian sarod, which isa descendent of the rebab. Skin-covered instruments have also been common to Turko-Mongol peoples for centuries.